“Quality comes first” - siba opts for Star Proof. 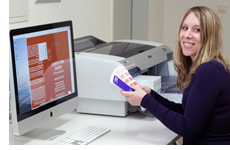 siba, a young and dynamic flexographic service provider in Lörrach, Germany has installed a Star Proof/Epson inkjet proofing system to ensure their customers receive the highest quality print simulation. The company, which was founded in November 2010 by industry experts Mathias Buergin, Ralph Simon and Jörg Ambrosius has been successfully driven through it’s start-up phase. Today, siba employs a staff of 12 and services renowned German, French and Swiss flexographic printing companies involved in the manufacture of labels, packaging inserts, flexible packaging and pharmaceutical capsules. The installation which was carried out by Graphic Republik, has allowed siba to create individual colour profiles for all printing situations, even for specific printing substrates and colours. This ensures that each customer can be certain that they are receiving customised, fingerprinted proofs which resembles their print set-up. Star Proof accepts Raster data in 1 Bit Tiff or Barco “Len” file formats at resolutions up to 4,000 dpi, screen rulings up to 223 lpi and support for the latest HD and NX Flexo screening technologies. The resultant data integral proof sets high standards in halftone inkjet proofing.